Marcus: Hi, everybody. It’s Marcus here, the organizer for the New England Bushcraft show. You can find us at newenglandbushcraft.org. Today I’m here with Malcolm from the Hidden Woodsmen. Malcolm, just want to give us– Thanks for joining us. We want to have a chat with you a little bit about what excited you about bushcraft, what got you interested in this whole bushcraft spaces. The question is, what does bushcraft “mean to you”? Malcolm: Well it all started when, for a lot of guys, I noticed we started watching reality TV, and we started watching these Survivalman, Dual Survival. We would start going out to the woods, and as I started going to the forest and started going on mountain hikes, I realized that without all the fancy gears and stuff, I could die out here. The elements could hurt you. I understood a lot of this modern equipment we had was only available in the past few years. What did the man do before that? Before all this modern stuff, how did we survive? How did the ancient man live? Malcolm: Yes, like a primal feeling. It does. It makes you feel closer to the creation. Marcus: I think one of my favorite words, that I’ve seen on social media associated with the bushcraft space is feral. It opens up some feral component. Malcolm: Yes, we lost that in the modern culture. We lost that in the modern world. So you have that even the small, small– That’s why I got to it. Marcus: So if you’re interested in continuing the conversation with Malcolm and having a look at some of his products, join us at the New England Bushcraft Show April 28th and again newenglandbushcraft.org. Malcolm: Yes, yes. It’s very exciting because it’s something that we don’t have in this area of the country. We don’t have a lot of bushcraft people, people that understand the nature and what it provides. That to me is what bushcraft is. Is what the natural world provides for you, for medicines and food and shelter and all that stuff. That’s not common here. Very few people know about that stuff or even interested in learning. As the community comes together for this gathering, the community comes together to all learn together and to learn as a group and to even just meet one another, that really set my heart on fire because I knew that we needed a miracle to get this to come together. We need a gathering or a place where we all could meet. We can’t just meet in the local woods. We need to have an actual event that we all could come to, and this was perfect for that, so I was fully onboard. I’m really glad that you started something like this, that we were able to all come and meet everybody. Marcus: Excellent. I would build on that and say that if you know what bushcraft is, then you’ve probably already got your tickets for the New England Bushcraft show. If you don’t know what it is, but if you’re into homesteading or hunting or adventure travel or a whole variety of outdoor pursuits. There’s going to be a component of what bushcraft can teach you and share with you that will be critically important to you, whether it’s wilderness medicine or being able to know how to make a fire in an emergency. Lots of different things that could be really, really valuable to you. Come and see us at the New England Bushcraft show April 28th. Come and see Malcolm’s booth, and we’re excited to have you there. Marcus: This is Marcus with New England bushcraft organization. Today I’m having a campfire chat with Malcolm from the Hidden Woodsmen. I’m really excited to announce not only is Malcolm going to be a vendor providing access and insights to his products and talking to customers, but he’s agreed to do a workshop for us. Malcolm, why don’t you tell us a little bit about the workshop that you’ll be putting on at the New England Bushcraft Show? Malcolm: Just to give a disclaimer, I’m not a sewing teacher. I get asked all types of questions about what needles I use, and I don’t really teach that stuff, although I do share that information. For this gathering I think is very important that I do something like that, so we are going to make a tinder bag, a simple tinder bag. That’s one of the first things that I’ve actually learned to do, so I want to share that for anybody who doesn’t know how to sew. Sewing is a very important skill that we’ve lost. We’ve totally lost it. Ask anybody that you know if they know how to sew, or they can just create clothes or anything, and very few people know how to do it. I think this is a very important skill that has been lost over time because of the job markets have moved overseas, so I’m hoping to just give some basic understanding of how to sew and how to make a tinder bag. It’s a very important skill that I think it has been lost that hope to regrow it in our community. Marcus: Awesome. Thank you. 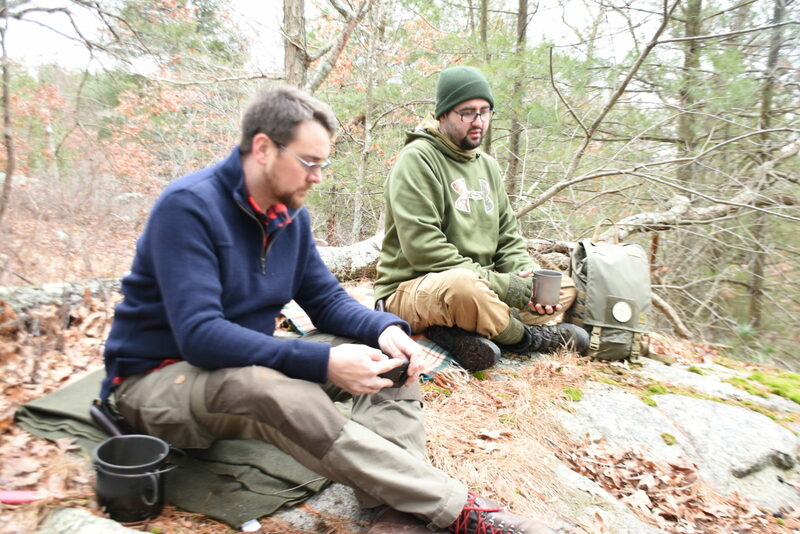 If you want to spend some time and make a tinder bag with the Hidden Woodsmen, come to the New England Bushcraft show, it’s April 28th in Charlton, Massachusetts. Tickets can be purchased, and more information can be found at newenglandbushcraft.org. Marcus: I’d like to make a quick shoutout to 508 International, they’re New England’s premier adventure playground. I think it’s how they’re branding themselves. We’re excited to be in a partnership with them for the New England Bushcraft show. Please check out 508 International. They’ve got a Facebook page as well as a website, and in addition to the New England Bushcraft show, there’s a whole range of other events that they’re going to be running throughout the year. We look forward to your participation. ← Best of the mountain man movies. For April 28th; is this like a group campout or a flea market? I’ve never been and would be driving up from NJ. Just want to know what to expect. Do you have to get tickets in advance or can you pay on arrival?